I'm trying to better understand the meaning of the phrase in the Skyy Vodka ad ("Vodka so filtered we even took the Russia out of it"). AFAIK the name Russia is never used with a definitive article, but I also doubt that Skyy promoters are uneducated. Can someone please explain why "the Russia"? It's a joke. Vodka is well known in the West as a Russian spirit, even as a stereotype of Russia. Skyy is saying that their vodka is so well filtered, they removed something that no one would have thought would be possible to remove from vodka (i.e., its association with Russia). That's all. If you start looking for alternate definitions of "Russia," or find it meaningful that Skyy is made by an Italian company, you're overthinking it. "The Russia" is not normally acceptable, as you note, but it follows a widespread pattern of pairing "the" with unexpected words in informal conversation for effect, as a form of metonymy: wipe the smug right off his face. You can take the [girl] out of the [country], but you can't take the [country] out of the [girl]. As just one example, the intended meaning is that a "country girl" (as in Southern/Midwestern American girl) could move to the "Big City" but still live and act in a "country" manner. Essentially the idea of the saying is that you can change your locale and location, but your essence remains the same. It is sometimes meant to be offensive, such as in the example above the speaker could be suggesting that the "country girl" is unrefined and cannot succeed by the standards of the "Big City" life. Or, it could actually be taken as a statement of self-empowerment -- suggesting in fact that no matter where you are or what your circumstances, you are still true to your roots and your core being. Therefore, in the case of this advertisement, Skyy is suggesting that the best vodka comes from Russia, such that Russia itself is a metaphorical component of the essence of vodka -- to the point that you cannot separate vodka from the notion of Russia. This takes Russia, the country, into a metaphorical existence as some essential component of something. Thus the reasoning behind the definite article with "the Russia". The advertisement is simply a joke to highlight that the while there is an innate harshness of grain-based alcohols -- since they retain a high percentage-by-volume (ABV, alcohol by volume) of ethanol (alcohol) -- there is also a desirability for taste and the notion of palatable "smoothness". So, expensive liquors are often touted for their "smoothness" as seen as a product of filtration, and many liquor brands will advertise something like "filtered four times", or some such similar statement. More filtration meaning less harshness in taste. 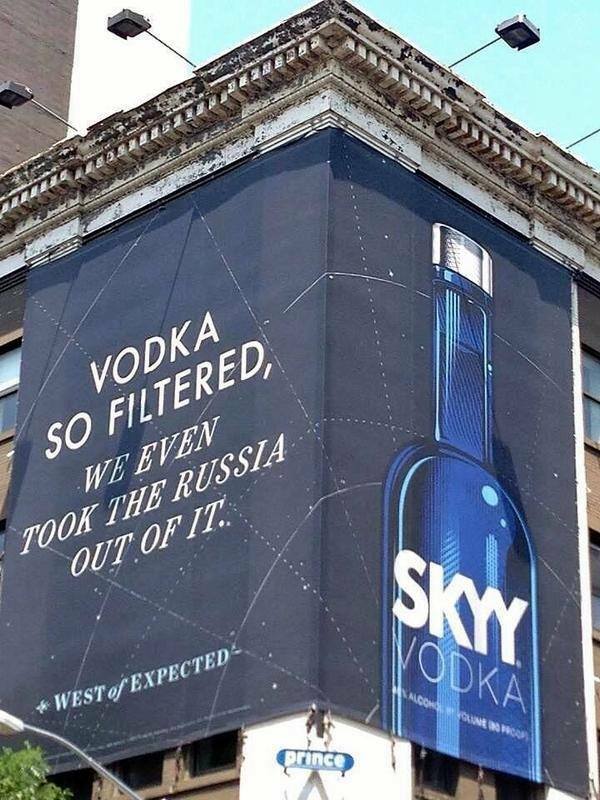 And to fully beat this dead-horse on explaining the joke, the idea is that Skyy has created a vodka so smooth by filtering it so well they even removed the essential "Russia"-ness of it, something assumed entirely inherent. And, again, their language in the wording of the advertisement is a direct reference to the colloquial, folksy phrase. I think you can be sure that Skyy promoters are well educated. Grammatical constructs that sound almost, but not quite, correct are used in advertising to draw and keep attention. The fact that this question was asked indicates Skyy succeeded in using "the Russia" in the ad. "Nobody doesn't like Sara Lee." The brand clearly wants to distance itself from the Russian varieties which appear to dominate the market. Given Russia's anti-Western, Anti-Gay, anti-European, anti-Ukrainian anti anti anti attitude who wouldn't want to distance themselves from that 'Evil Empire'. In this case Russian is seen as an impurity which this brand claims to have filtered out. The ad is brilliant -at least for those who read the news and understand just how unpopular Russia has become.